Consumer price index (CPI) for the month of July rose in the country's two largest cities, Hanoi and HCM City, according to the statistics offices in these cities. The July CPI in Hanoi grew by 0.18 per cent against the previous month's level and 0.77 per cent over the same month last year, the statistics office of Hanoi reported on July 22. 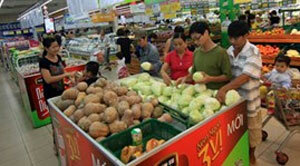 Nine of the 11 groups of goods used to calculate the CPI reflected a rise in prices this month. Of these, the price for the group comprising restaurant and catering services showed a growth of 0.13 per cent due to a strong surge in food prices. The price for the group of housing, electricity, tap water, fuel and building material increased by 0.32 per cent because of high demand for electricity and water from households during the hot weather period, said the office. The prices also rose by 0.26 per cent for the group of beverages and tobacco; 0.47 per cent for the group of textile, garment, hat and footwear; 0.38 per cent for the group of home appliances; 0.13 per cent for the group of culture, entertainment and tourism services; 0.11 per cent for transport services; and 0.18 per cent for other kinds of goods and services. However, prices for the groups comprising education and post-telecom services remained unchanged at last month's level. The office said gold prices in July reduced by 3.75 per cent but the US dollar price registered a slight increase of 0.01 per cent against the previous month, the Ha Noi Moi newspaper reported. Meanwhile, the HCM City Statistics Office yesterday reported that the city's CPI rose by 0.11 per cent in July over the previous month and 0.77 per cent year-on-year. Seven of 11 groups of goods used to calculate the CPI registered a rise in prices in the month of July. The highest increase in price was 1.36 per cent for the group of health care services. The prices rose by 0.13 per cent for the group of restaurant and catering services due to a strong surge in food prices; 0.23 per cent for the group of garments, hats and footwear; and 0.09 per cent for the transport group. 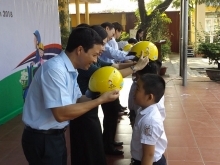 The office said the two groups saw a fall in prices, including the group of housing, electricity, tap water and fuel (0.19 per cent) and the group of culture, entertainment and tourism (0.03 per cent) while price of education services remained unchanged at June level, the cafef.vn reported. In HCM City, prices of gold and the US dollar fell by 1.49 per cent and 0.01 per cent, respectively./.